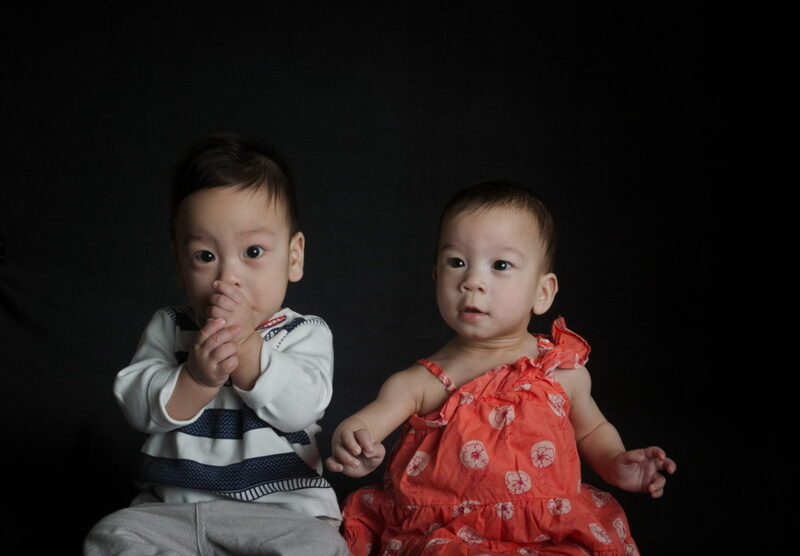 I meant to write about the lighting setup in the blog post in which I uploaded the photos from the 7 Month photo shoot, but with twin 7 month olds, there’s never enough time for anything – even with my mother-in-law in town helping us out. Oh well, at least I don’t have to pay per post. First of all, I’d like to discuss the concept I wanted to go for. For the Five Month photos, I went with the balloon theme I posted about here. For month six, I didn’t do anything special. Danielle did her usual couch portraits. But this time around I had a bit more time for the photos and I started thinking about it a week or two in advance. Unlike 2 months ago, both children were able to sit on their own now for extended periods of time. As of when I took the 7 month photos, the only thing that made them tip over was when they got over-excited and tipped back. It’d been a while since I had done portraits with the black background and I wanted to switch it up a bit. Because I don’t have any formal photography training, I like to browse the work of other photographers to get ideas I can take and make my own. Gavin Hooey, who has a great series of videos on Youtube through the photography store Adorama, has a dark grey background at his studio. He likes to have a highlight behind the model rather than just a plain dark background. If you look at his photos, he does it more often than he doesn’t. I figured it might help with the look of the photos. If you don’t do it, then you really do need to use a light as a hair light in order to keep dark-haired subjects from merging into a black background. Let me go over why I set it up this way. Unless you purposely want to have the main light cast shadows on the background (and there are some times you might want to) you want to have your subject away from the back of the backdrop (or wall). So the kids were just about 6 inches from the front where the cloth ended. The octobox was just about a foot away from the kids. With lights you want them as close as possible and as large as possible most of the time as it will give you soft shadows. 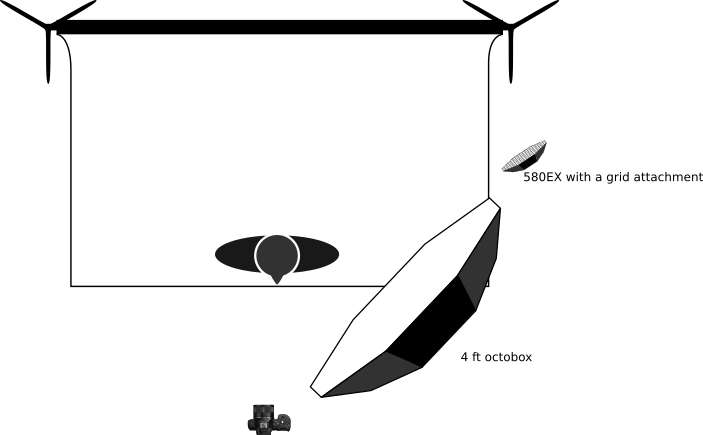 Also, when you get to a modifier as large as this 4 foot octobox, the light starts to wrap around the subject. So what I love about it for the kids, is that with how small they are, it ends up allowing me to shoot with a much simpler setup – just one light, but the kids are well lit with just enough shadow to keep the image from looking flat. Normally, for the highlight behind the subject, the photographer would put the light source right behind the subject. Their body hides it and you end up with a perfectly centered highlight. Since the kids are so small, I wasn’t able to do that. So I had to put the flash off the to side and aim it straight at the right spot. By putting the grid modifier on the flash, it ends up focusing the light more. It’s not as tight a light as a snoot, but it still does keep it from spreading all over the place. The last thing is that when I put both kids into a shot, I had Sam a little further forward than Stella. Not enough to be noticeable, but enough to keep Stella from throwing Sam into shadow. That’s something I’ve had to learn as I work with multiple people and lighting. I practiced with myself, so I’m not used to the pitfalls of lighting more than one subject.